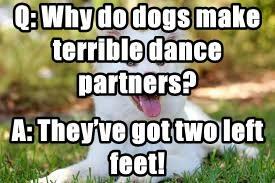 Q: Why do dogs make terrible dance partners? A: They’ve got two left feet! Q: Why does Leia wear buns on her head? Q: What do you call a pirate droid? Q: What do you call two suns fighting each other? Q: What does Yoda say to encourage a Padawan before a test? Q: How many Alderaanians does it take to change a light bulb?